When deciding on stools verses chairs for your dining room, kitchen or home bar, a few design components require some thought. Both seats have their merits, so it's best to choose the chair or stool that fits the available space, needs and decor. Stools are seats featuring three or four legs. Made from a variety of materials, a stool may feature a painted or stained finish as well as cozy upholstery. These pieces can offer a backrest or come backless. Stools may also stand taller than the typical table to fit a tall counter and bar. Chairs usually have four legs, a seat and a back. They can include arms or footrests. Most models have a wood, metal or plastic frame with a range of padding and fabric options. 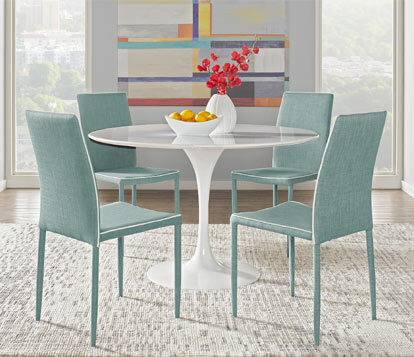 Dining chairs are typically sized at the proper height to comfortably fit a table. If you're working with limited room, using stools vs. chairs makes sense. A stool set often has a smaller footprint and backless models are easy to store under a table or counter. In contrast, chairs take up more room, which can be a problem for conserving square footage or seating all your guests. Ergonomic design is a key factor when considering stool vs. chair sets. Since backless stools lack lumbar support, they are best for areas that see occasional or short-term use such as bars and breakfast nooks. Chairs with high backs and plush seats offer more structure, inviting guests to settle in and dine comfortably for longer stretches of time. For a minimalist or industrial room, simple wood or metal stools are an ideal match. A rustic style bar with a leather-upholstered stool set is also a winner. On the other hand, pub chairs create a laid-back country club vibe and upholstered dining chair sets come in an array of hues and patterns to complement your color palette. Are Stools or Chairs Right for You? When choosing stools and chairs, there are plenty of hybrid options to consider as well. 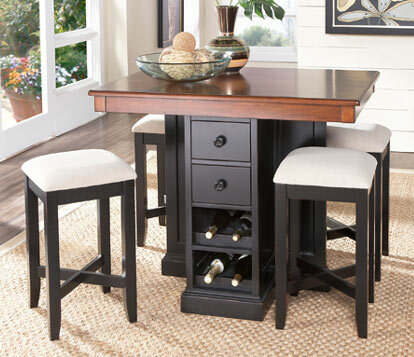 For example, bar height stools often include backs and arms, which are great for kitchen islands or counters. Whichever type of stool or chair you select, taking space, comfort and decor into consideration will help you find the perfect fit. Read more about bar stools and chairs here: Bar Stool Buying Guide and Dining Chair Heights.